Excellent renovated holiday home 7 km from the beach. Choose between two beautiful sandy beaches, Plage de Kersiny and Plage de Mesperleuc. 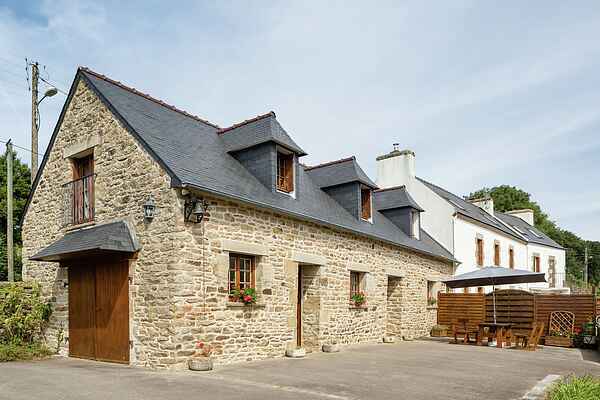 Your holiday home is part of a former traditional Breton farm. The house offers a large garden, a beautiful panorama and a very quiet location. At 6 km, there's the tourist seaport of Audierne. This town has an aquarium and you'll definitely want to go and soak up the atmosphere. The bustling harbour is close to many restaurants and shops. You can also rent canoes to row up the Goyen, or take a boat to the island of Île de Sein. If you don't have sea legs, you can rent bicycles in Pont-Croix (1 km) and explore the area by land. The pleasant seaport town of Douarnenez (14 km) has a beautiful maritime museum. The Pointe du Raz (30 km), the western point, offers a magnificent view. There's Bel Air amusement park near Landudec (20 km) and Piscine Ludique water park near Quimper (32 km). Your children won't want to miss this fantastic experience. All facilities such as shops, a bank, a post office, a tennis court and a market can be found in Pont-Croix.